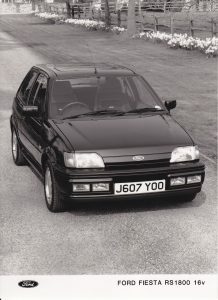 The Fiesta RS 1800 was a car that was all about performance, style and sheer fun to drive. The deep front air dam with its built-in driving lights, the tailgate spoiler and the rocker extensions give it handsome yet purposeful lines that are set off with smart new five-spoked alloy wheels carrying grippe, low profile 185/55 HR14 tyres. And the Fiesta RS 1800’s looks do not flatter to deceive, for the advanced new 16 valve, 130 PS engine delivers lively and effortless acceleration together with an impressive turn of speed. It is coupled to Ford’s latest, slick-shifting MTX 75 five-speed transmission for supreme drive satisfaction. 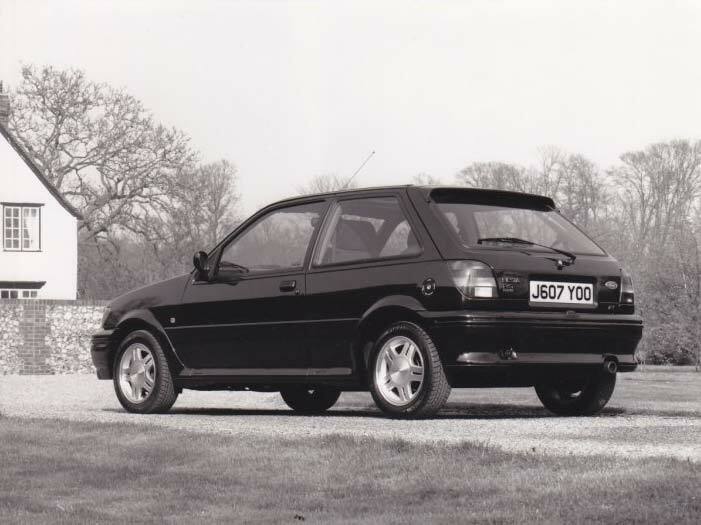 With a lower ride height, gas-pressurised dampers and anti-roll bars front and rear, the Fiesta RS 1800 is a rewarding and secure machine to drive. Effective, insulation measures against noise and vibration, and finely tuned suspension settings make it refined and comfortable, too. The ample performance is ably backed up by a powerful braking system with large diameter ventilated discs on the front wheels and the option of anti-lock brakes. The fiesta RS 1800 is available in a range of sporting colours, Diamond White, Black Radiant Red, Moondust Silver and Pacifica Blue, with suitably colour-coded exterior fittings. 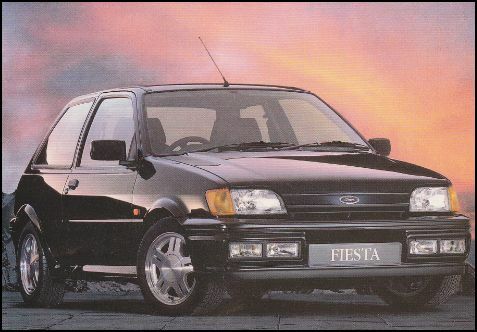 The 16 valve electronically fuel-injected, 130 PS DOHC engines of the Fiesta RS 1800 is an integral member of a new Ford family of power units designed and developed to play an important role in Ford engine requirements in markets around the world right through into the next century. It is the result of four years’ research and massive financial investment, using computer-aided design and ultra-modern engineering techniques to produce a state-of-the-art power unit. The multi-valve configuration of the new engine was chosen because it enables a number of different desirable characteristics to be optimised. 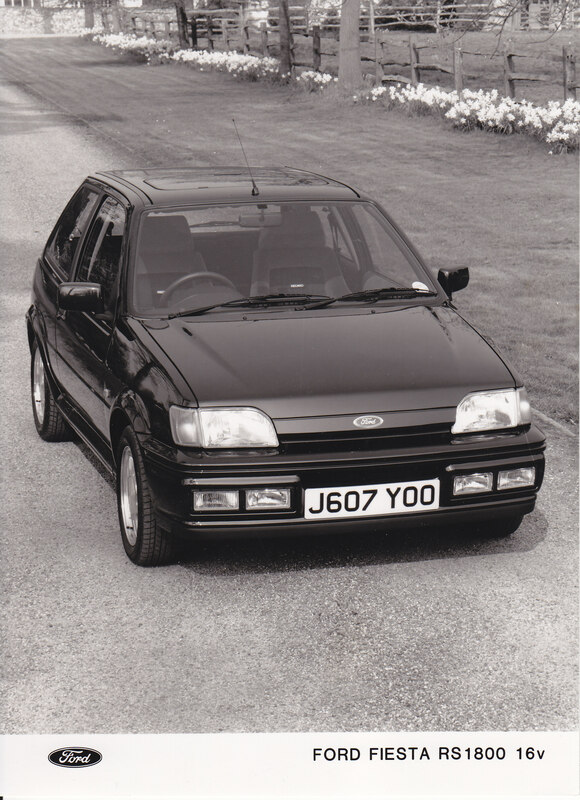 Not just the levels of power and torque that a Fiesta RS 1800 driver will particularly appreciate, but also smoothness, easy starting, flexibility, good fuel economy and because the combustion can be regulated very accurately – low exhaust emissions. The engine is built around a lightweight, cast-iron block and die-cast aluminium cylinder head. A cast aluminium oil pan is also used, contributing to the unit’s exceptional rigidity. The engine is of the ‘long-stroke’ pattern, which further enhances its flexibility, and the double overhead camshafts are operated by a newly developed, long-life toothed belt. The engine is controlled by a new version of Ford’s powerful EEC IV engine management computer. This also regulates the electronic fuel injection which has the latest ‘sequential’ operation for pin-point accuracy of fuelling. Central to the success of the new engine is a combustion chamber using sophisticated gas dynamics called High Velocity Tumble, (HVT), to create fast and complete burning of the incoming charge of fuel and air. Careful choice of inlet port shape and valve angle enables the mixture, in effect, to ‘tumble’ quickly into the combustion chamber as the inlet valves open, then form a tight ball of gas for rapid burning. This maximises the energy output from each charge of fuel, helping the engine produce its excellent torque figures. The engine is also equipped with a three-way exhaust catalytic converter which cleans up as much as 95 percent of the remaining noxious components of the exhaust gas. The catalyst is regulated by electronic ‘closed loop’ control. A special sensor monitors oxygen levels in the exhaust gas and, via the EEC IV computer, suitable regulates the fuel injection settings to provide the correct air-fuel ration needed for complete combustion. Because the catalyst works best when the engine has reached operating temperature, the EEC IV computer injects secondary air into the exhaust manifold to minimise emissions.